More information: Castles is the 2019 solo album from Daniel Tompkins (the innovative singer-songwriter known for his work with TesseracT and Skyharbor). Inspired by the arc of relationships - tragic mistakes, misjudgements of character and victorious, passionate love - the album was written alongside US producer Eddie Head (Haji's Kitchen). 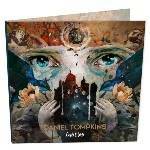 The music is a dynamic realisation of Tompkins' expansive ability and taste: Pulsating synths, beautiful keyboard lines, powerful electric guitars, heavy crash cymbals, and both skittering and forceful beats. The space created by the production allows Daniel's voice to switch skilfully from tender and introspective to soaring emotion in a blend of pop-rock-electronic soundcapes.. The album features six alternative tracks with special guests Acle Kahney (TesseracT), Grammy-nominated Randy Slaugh (Periphery, Devin Townsend), Paul Ortiz (Zeta, Chimpspanner) and producer Dmitry Stepanov.